1200+ laps now and no sign of sticking or skipping. It ain't happening! I don't know if it's possible to get more uniform than this. But I'm done on this one. Shave test is the only thing left. But it never felt like it wanted to stick. Well, not all stones will. Depends on their texture & particles. I was looking for the sticking. I dont think Excessive is a big enough word for what I did. LOL. onimaru55 and ScoutHikerDad like this. I noticed , at least with my stones that when I started using tape, a lot of the sensation went away in my hand. The tape doesn't kill all feedback, but for me it definitely muted it. I still will get certain feedback cues that let me know I'm close to being done, but sticking all but went away. Still will get a chatter feeling, or skipping, and that's when I strop the living crap out of the razor and do another like 10-20 laps on just water, until the chatter comes back. I typically finish on slurry for my stone, but if i'm trying to lop pimples off then I go to straight water. I will add that after a good while with my stone and trying other peoples edges out, my jnat is most definitely a pre finisher that's pretending to be a finisher. Great edges just not hyper keen and smooth like I've tried from others. ScoutHikerDad, Toroblanco and Gasman like this. "If the brakes don't stop it, something will"
I often find that I start getting that sticky sensation with a taped spine at around 1300 laps. Man! You were almost there. onimaru55, ScoutHikerDad, Euclid440 and 5 others like this. In my quest for the 'one' in the Jnat category, I was told that one of the things to look for in a top class stone was that it not have that sticky feeling. At that level it was not a desirable traight to have in a stone. It is actually a trait of kiita stones, they were known for being silky and a lot less chance they would have the trait of being sticky. Not that every kiita is going to have this trait, just something to look for. A asagi or any other color can have it too just a lower chance. Gasman, by your description you seem to have one of those sought after stones! If its the sought "after stone" well, that's cool. Maybe it is or not but either way I just have to figure out the details now. @Steel, thanks man. Now you tell me. Now i got to start all over. I was afraid tape might have something to do with it. But i prefer to use tape to adjust angles and protect. Shave test in an hour on that blade to see how it went. I did do only 10 laps on clear water just to see where that goes. I know i went overboard but i said i would go until it got sticky. Hey, its all fun anyway. It was an hour of serious honing to hit that number. So not too big of a deal. Now i know its not going to stick. Ever! Steel, Toroblanco and yondermountain91 like this. As expected, the shave was keen but no smooth to it. Over did the hell out of it. Id blame it on clear water for the last few laps but with what I did its hard to say it was one thing. Oh well. I still feel good as Im narrowing down the options on how the use the stone. Still got a couple more ideas so it ain't over yet! Steel, Steve56 and Gasman like this. I did figure out i can do around 100 laps in 5 minutes, give or take. So there, I did learn something. 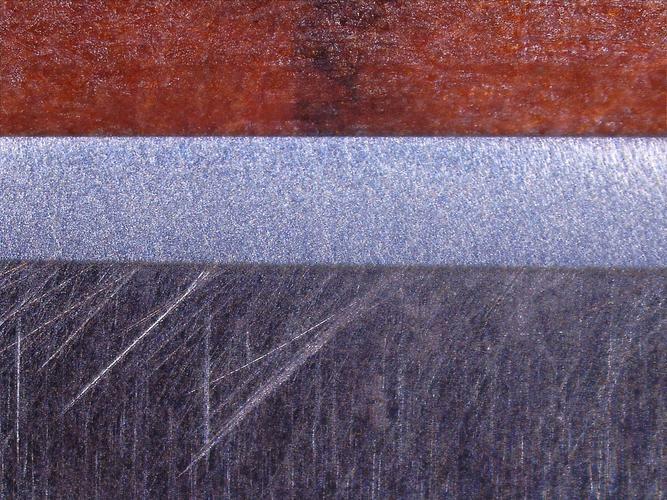 Stiction (sticking-friction) occurs when the plane of the bevel and spine are in perfect alignment with the surface of the stone and water or slurry make up for the slightest anomaly. The bevel is completely flat and in the plane of the spine, bevel angle. The spine is controlling the angle, and the slurry is of a consistency that allows the bevel to cause friction over a large plane (the bevel). It is probably easier for a un taped razor to stick as tape will vary the spine smoothness, though I get stiction with Kapton tape over electrical, it is smoother, slicker and more wear resistant. If you are using tape, the wear flat on the spine and bevel may not be in alignment, as only the bevel angle has changed. If you were not using tape they would have worn together and be in perfect alignment. As said not all stones will produce the right consistency of slurry to cause the added friction. It is not an indicator of stone performance or even keenness of the edge, just flatness of the bevel, (e.g. the edge could still have micro-chips). Chances are though, if the bevels were properly set/ honed and flat, stiction can be an indicator that it is as flat as the bevel will get. So, does that mean honing without tape will make a better/flatter bevel? No, because really all we are interested in is the flatness of the bevel at the edge. Are the bevels meeting at a continuous straight edge? For the quality of the edge, it does not matter, tape or no tape, the benefits of tape out weigh the risk of spine damage. Try some Kapton tape. Or do your Jnat honing without tape, wear will be minimal, see if it sticks.